Chico and the Man is an American sitcom that aired on NBC for four seasons from September 13, 1974 to July 21, 1978. It stars Jack Albertson as Ed Brown (the Man), the cantankerous owner of a run-down garage in an East Los Angeles barrio, and (until his suicide late in the third season) Freddie Prinze as Chico Rodriguez, an upbeat, optimistic young Chicano who comes in looking for a job. It was the first U.S. television series set in a Mexican-American neighborhood. Comedians Cheech Marin and Tommy Chong (better known as the comedic duo Cheech & Chong) have stated that series creator James Komack followed the comedians on tour for three months; Chong wrote in his 2009 book Cheech & Chong: The Unauthorized Autobiography that Komack based the show on Cheech and Chong skits titled "The Old Man in the Park" and "Pedro and Man" and had acknowledged that fact to Chong after the television series' release. Cheech and Chong have both stated that Komack had originally approached them to star in the show, but they turned down the offer, preferring to stick to films. Komack told the Associated Press that he first tried working with Cheech and Chong on a show about a Chicano and a Nisei. Komack said he decided to make the show about a young Chicano and a "seventh-generation WASP" after he and the comedy team "couldn't get it together". A hard-drinking Anglo widower, Ed stubbornly refuses to fit in with the changing East L.A. neighborhood and has alienated most of the people who live around him. He uses ethnic slurs and berates Chico, a Latino, in an effort to get him to leave when Chico comes looking for a job. Yet Chico sees something in Ed, and sneaks back in at night to clean up the garage and move into an old van that Ed has parked inside. As Ed sees all the effort Chico has put in, he begins to warm to Chico. Over the course of the show, Ed grows to see Chico as family, although Ed denies this on several occasions. The chemistry between Jack Albertson's "Ed" and Freddie Prinze's "Chico" was a major factor in making the show a hit in its first two seasons. It debuted in the top 10 and remained there for the first two seasons. The show was created by James Komack, who produced other successful TV shows such as The Courtship of Eddie's Father and Welcome Back, Kotter. Freddie Prinze was discovered by Komack after he appeared on The Tonight Show Starring Johnny Carson in December 1973. Komack thought he would be perfect for the role of Chico Rodriguez. As the show progressed, Chico's background was revealed as being Mexican on his father's side and Puerto Rican on his mother's side, and (in a nod to Prinze's faux-Hungarian ancestry) "...my grandmother speaks a little Hungarian!" (though Prinze's paternal ancestry was actually German, in his stage-act he would claim his father was Hungarian, thereby allowing him to comically refer to himself as "Hungarican"). Chico was revealed to have spent part of his childhood in Hungary following the death of his mother, being raised by his Aunt Connie (a character who appeared in two other episodes). Chico attempts to explain his situation to Ed by portraying it as the dilemma of his distant cousin in Hungary, torn between the farmer for whom he now works and whom he has grown to love, and another farmer who has offered him a better job. During this scene and this episode, the love between these disparate characters was made clear for the first time, which Chico's cousin Carlos (played by actor Richard Yniguez) notes when he releases Chico from his promise. By the second season, Ed begins to see that he is a part of a bigger world, although he still complains about it. By this time he has found himself a girlfriend by the name of Flora (played by Carole Cook). The theme song was written and performed by Jose Feliciano. After struggling with depression and drug use, Freddie Prinze shot himself on January 28, 1977. He was taken off life support and died the following day at the age of 22. The last episode to star Prinze, "Ed Talks to God", was taped several hours before Prinze's death. After Prinze's death, the producers considered canceling the show, but opted instead to try replacing the character. To write Chico out of the script, they had the other characters comment that he had gone to visit his father in Mexico. The third season finished out with episodes focusing on the other characters in the show. Early in the fourth season, a replacement for Chico was introduced. Instead of an adult, the producers brought in 12-year-old Raul, played by Gabriel Melgar. His first appearance came when Ed and Louie go on a fishing trip to Tijuana and find the Mexican orphan hiding out in their trunk on their return. At the end of this episode, Ed is putting Raul to bed and accidentally calls him Chico. Raul corrects him and Ed remarks, "You're all Chicos to me." Ed eventually adopts Raul, only to have Raul's overprotective aunt Charo – played by the singer Charo – come from Spain and try to become a part of the "family", as well. A two-part episode ran in the final season in which Raul discovers Chico's belongings in a closet. Ed catches Raul playing Chico's guitar and Ed smashes it on the van in anger. Raul believes Ed does not love him anymore and runs away to Mexico. Ed goes after him and finally explains to Raul that Chico died, but did not say how, putting a measure of closure on the fate of Chico in the series. Toward the end of the show's final season, actress Julie Hill was added to the cast as Monica, Ed's attractive 18-year-old adopted niece. She had come to Los Angeles to get into show business, and lived in Chico's old van while awaiting her big break. Chico and the Man did not pull in the numbers as in previous seasons. The show's ratings declined after Prinze's death, and the show was canceled at the end of the fourth season. The show also had a veteran and talented supporting cast. Scatman Crothers portrayed Louie Wilson, Ed's friend and garbage man; Bonnie Boland played Mabel, the mail lady; Isaac Ruiz portrayed Mando, Chico's friend; and Ronny Graham played Rev. Bemis. Also, Della Reese played Della Rogers, Ed's neighbor and landlady. Avery Schreiber (center) is a very unsuccessful fortune teller Ed and Chico try giving a hand. Herbie Faye appeared as Bernie in the 1975 episode "Louie's Retirement". Additionally, Jeannie Linero appeared in several episodes as one of Chico's more constant girlfriends, nurse Liz Garcia. 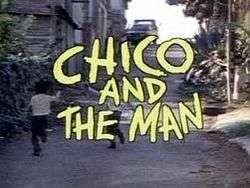 Chico and the Man was only shown in syndication in few markets and only for a relatively short period. It was briefly re-aired on NBC's morning schedule from May 9 to December 2, 1977. at 12:30 p.m./11:30 a.m. Central Time. TV Land also aired reruns during 2001 as did ION Television in 2007. AmericanLife TV Network also aired this series previously, as well as WGN-TV in Chicago which aired first at 5 p.m., then later on moved it to 5 a.m. In Canada, the show previously appeared on Sun TV (CKXT-TV) in Toronto. From 2005 to 2009, episodes of the show were available on AOL's now-defunct video website called In2TV. "Pilot" (September 13, 1974): Chico tries to persuade Ed to give him a job in the garage. "If I Were a Rich Man" (January 31, 1975): Chico has fallen head over heels in love and Ed is trying to turn him right side up. "Chico and the Van" (October 17, 1974): A city official claims Chico's van is illegal, so he moves in with Ed. "Chico's Cousin Pepe" (February 11, 1976): Chico's blind, women-chasing, singing cousin Pepe visits. "Chico's Padre" (February 4, 1977): Chico's long-lost rich father, Gilberto, returns to give him a better life. "Ed Talks to God" (March 4, 1977): Chico tries to change Ed's mind about not attending his own birthday party by having Ed's old friend impersonate God. ↑ McNeil, Alex (1996). Total Television: The Comprehensive Guide To Programming From 1948 To the Present (4 ed.). Penguin Books. p. 161. ISBN 0-14-024916-8. 1 2 Presenter: Neal Conan (2010-01-28). "Cheech And Chong Reunite, At Long Last". Talk of the Nation. National Public Radio. Retrieved 2012-07-11. 1 2 3 Chong, Tommy (2009). Cheech & Chong: The Unauthorized Autobiography. Simon and Schuster. p. 159. ISBN 1439153523. 1 2 "'Chico' Had Rocky Beginning". Lakeland Ledger. Associated Press. 1975-04-28. Retrieved 2012-07-11. ↑ "TV listing". The Bakersfield Californian. April 20, 1975. Retrieved January 8, 2015 – via Newspapers.com. (registration required (help)). Ed Brown reacts explosively to Chico's plans to move to New York and the crisis continues until Cousin Carlos (Richard Yniguez) arrives at the garage. ↑ "Freddie Prinze: Too Much, Too Soon". Time Magazine. February 7, 1977. Retrieved 9 September 2010. ↑ The Show Must Go On: How the Deaths of Lead Actors Have Affected Television, Douglas Snauffer, Joel Thurm. Mcfarland Press. p. 73. ↑ Snauffer, Douglas; Thurm, Joel (2008). The Show Must Go on: How the Deaths of Lead Actors Have Affected Television Series. McFarland. p. 78. ISBN 0-7864-3295-0. ↑ Brooks, Tim; Marsh, Earle F. (2007-10-17). The Complete Directory to Prime Time Network and Cable TV Shows, 1946-Present (9 ed.). Ballantine Books. p. 250. ISBN 0-345-49773-2. ↑ "ION Media Networks Announces Programming Agreement for Extensive Line-up of Theatricals and Television Series from Warner Bros. Domestic Cable Distribution" (Press release). ION Media Networks. 2006-07-27. Retrieved 2007-06-10. Wikimedia Commons has media related to Chico and the Man.